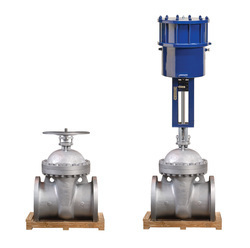 Manufacturer of a wide range of products which include pneumatic globe valve, pneumatic 3 way mixing regulating valve, pneumatic ceramic double disc gate valve, pneumatic control valve with top handwheel, pneumatic linear control valve and pneumatic y type trap drain control valve. 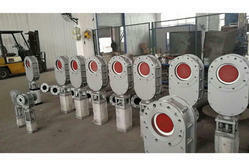 Control valve Actuator : Pneumatic:multi-spring diaphragm actuator, piston type actuator. 1. Before Installation, it's necessary to clean the valve and remove possible defects caused in the transportation process. 2.Check carefully whether marks and the nameplate on the valve meet operating requirements. 3. This valve can be insstalled on pipelines at any angle. 4. 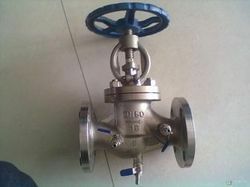 This valve shall be fully open or fully closed in running and not be used as a throttle valve, or else its sealing surfaces will be washed and get worn faster. 5. For Long term storage, it shall be stored in a dry and ventilated room whth periodic check to avoid rust. 6. Knocking shall be avoided in the transportation process. 1. Use a Cylinder as the actuator to drive the gate directly to move up and down, with fast opening/closing. 2. The double gates adopt floating connection to produce reliable one-way seal under the medium pressure action. Also the floating connection can drive the gate to rotate up in opening/closing due to misaliginment of axial lines so that the friction grains between the valves' gate and seat are distributed evenly to produce no linear abrasion, thus improving its service life greatly. 3. Sealing surfaces of the valve's body and gate are lined with anti-wear ceramics, with excellent resistance to abrasion. 4. Being compact, it's easy for transportation, installation and maintenance. When the cylinder drives the gate to move downwards through the valve's stem, sealing surfaces of the valve's gate and body will be engaged to cut off the channel, namely, closing; the other way around is opening. 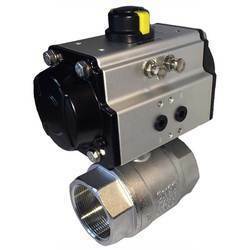 Actuator : Pneumatic: multi-spring diaphragm actuator, piston type actuator. Direct action : Pressure increase, stem descend, valve close. Reaction : Pressure increase, stem ascend, valve open. Size 1 1/2" to 12"